Warner Bros. Pictures & Dwayne Johnson wiped the dust off of Bally Midway’s Rampage video game & resurrected it on the big screen. The live-action take on the Rampage series definitely does not follow the story that some old school gamer will remember, but it does bring a generic & cheesy feeling to its fresh take on the story. Rampage stars Dwayne Johnson, Naomie Harris, Malin Åkerman, Jake Lacy, Joe Manganiello, & Jeffrey Dean Morgan. The film follows Davis Okoye (Johnson) whose best friend George, an albino gorilla, is infected by a mysterious gas that not only makes him grow in size but also in strength & speed. Okoye’s journey to save George before he’s killed by the government takes a sharp turn when a giant wolf & lizard become affected by the gas & start wrecking havoc. You shouldn’t go in expecting a great monster film or a great story here. The story is incredibly cheesy & loses its direction midway through; no pun intended. It starts off with this serious tone that takes place outside of the story of Okoye & George, which is reminiscent to Cloverfield Paradox. The story then spins into this overly revisited lighthearted story about friends & midway through decides to kick it up a notch by showing people being eaten, torn apart or smashed by falling debris. Johnson does a solid job here with what he was given, but the cheesy script smothers him & his standout moments. The connection between Okoye & Kate Caldwell (Naoimie Harris) was weak & forgettable at best. However, I will say that Jefferey Dean Morgan added contributed heavily with the comedy & added a welcoming presence as Harvey Russell. The scenes between Johnson & Morgan were some of the best scenes in the film & I feel that the film would’ve been much better had they teamed up rather than Johnson & Harris. Another weak part to this film was the antagonists Claire Wyden (Malin Åkerman) & Brett Wyden (Jake Lacy), who were ultimately the American versions of Rock & Bullwinkle’s Natasha Fatale & Boris Badenov. Their characters were incredibly cheesy, especially Lacy’s character. It’s clear that the film relied heavily on comedy, but it fell flat at every turn. There are times where it’s very clear that we are watching Dwayne Johnson on a green screen with a giant silverback gorilla & it isn’t pretty. The film juggles between making the human characters blend in well with the mutated monsters to making them look a mess when they’re in a scene together. Writer Ryan Engle & director Brad Peyton did what they could do with a video game that only focuses on mutated animals destroying cities & eating people. However, it feels like because the video game series is filled with 80’s-90’s cheesiness that Engle felt that the film should go that route rather than taking this into a much darker & enjoyable realm. 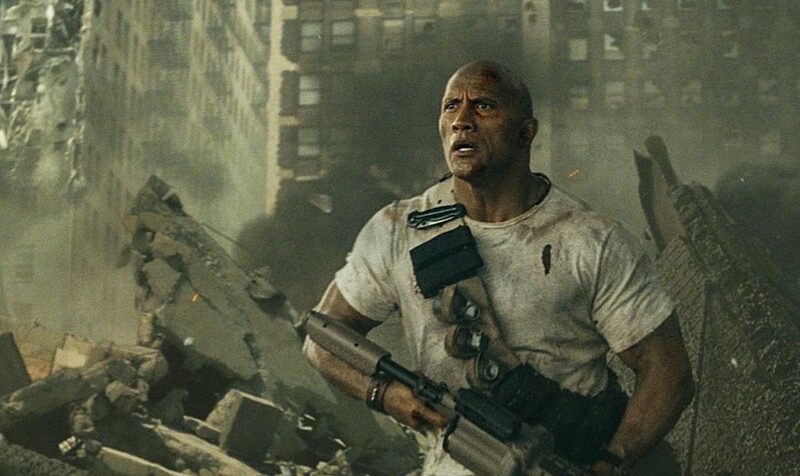 All-in-all, Rampage is lazily written & directed, relies on comedy to propel the story forward, is overly cheesy & at times the actors miss their mark with their performances. If you don’t mind cheesiness, a weak story & some monsters wrecking havoc, you’ll probably enjoy this. Jeffery Dean Morgan stole the spotlight. I would've liked to have seen more of him & his character explored. The unexpected gore was pleasing. The story was overly cheesy. It's very clear during certain scenes that the actors are on a green screen set. The villains were weak & barely visible.